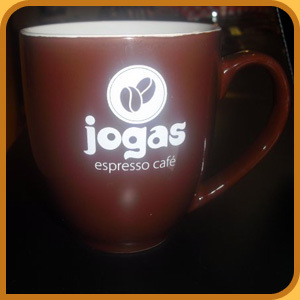 Get To Know Jogas Espresso Café! Jogas is a name derived from a rather obscure inspiration. As one of the original owners, Nik Green went about business planning the café as he was downloading songs on the original Napster. One of the songs he downloaded that played a lot during the process was called Joga by Icelandic pop queen Bjork. When needing a fifth name to fill out a survey on which names people liked most, Joga became Jogas and was added. A near unanimous decision resulted in it being the winner over Greens favoured, Stomping Grounds. The name itself is actually the name of a woman who was Bjork's masseuse and confidant. It has a dual meaning as the name of a flower also much like Daisy or Rose. The name turned out to be the right choice as the owners noticed people wouldn't say they were going for coffee, they would say they are going to Jogas as if it were assumed as the destination of choice. Roger and Donna Soviskov have lived in Grand Forks for over 40 years and is where they have raised their family. So when Roger´s employer “Canpar” shut its doors, the Soviskovs saw another door open. Jogas espresso was originally opened in 2000. 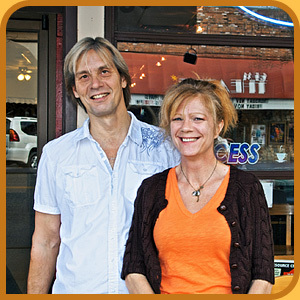 Jogas changed ownership once more before Roger and Donna bought it in 2009, where it truly is becoming a family business. Two of their five children are currently employed at Jogas, and on any given day, 5 of their 12 grandchildren could come in for a visit. Jogas espresso café is located in beautiful downtown Grand Forks, BC on Market Ave., where they display local art and photography. 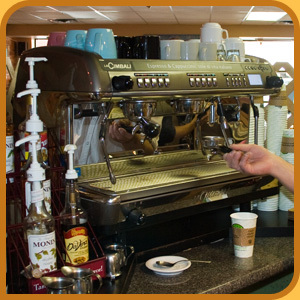 Jogas features Organic, fair trade espresso from “Kootenay Coffee Co.” in Nelson, BC. The espresso is made with the M39-Cimballi, a new espresso machine acquired from Italy which is the only one in western Canada. 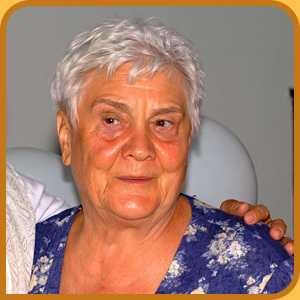 Jogas also offers Homemade Authentic Russian Borscht made by Roger´s mom, Lucy who has years of cooking dating back to the Yale Hotel. There is daily baking of muffins, cookies, and pastries, daily lunch specials, drink specials and free wireless internet. We also provide an Eat-In or Take-Out menu. We have over 50 syrup flavours for coffees, and frappés. Plus we have real fruit for smoothies and shakes. Donna, Roger and their friendly helpful staff hope to make you feel at home offering winning smiles, helpful information and a great cup of coffee. Come in any time for that great coffee/tea, read the paper, surf the net, relax on one of our comfy couches, and join our little family atmosphere.